The final polls published in Israel this evening will indicate that Benjamin Netanyahu’s Likud is edging ahead of its closest rival the Blue and White party and Bibi is on course to lead the next Government of Israel. The exit poll broadcast on Tuesday at 22:00 will confirm the prediction. I might be wrong. It’s possible that a large number of undecided voters will swing behind Benny Gantz. Or that one or more of the small right-wing parties fail to win any seats, making a new Netanyahu led Government impossible. But if Bibi does become the next Israeli Prime Minister, here’s why it happened. It’s worth assessing the enormity of the achievement. A fourth election win in a row, five in total if you include his time as Prime Minister from 1996-1999, and the chance to overtake David Ben Gurion and become Israel’s longest serving Prime Minister. He has done this in difficult circumstances. The Attorney General recommended he be indicted for bribery, fraud and breach of trust. He will have a hearing later this year and, when the Attorney General makes a final recommendation that he be indicted, Bibi is heading to trial. A new political force emerged to challenge him consisting of three former IDF Chiefs of Staff led by Benny Gantz. Just last week, missiles were fired from Gaza, highlighting the unfinished business of last year and Bibi’s inability to deal properly with Hamas. Why did none of this matter? The corruption charges were expected to dent support for Likud and drive away moderate right-wing voters. That hasn’t happened. 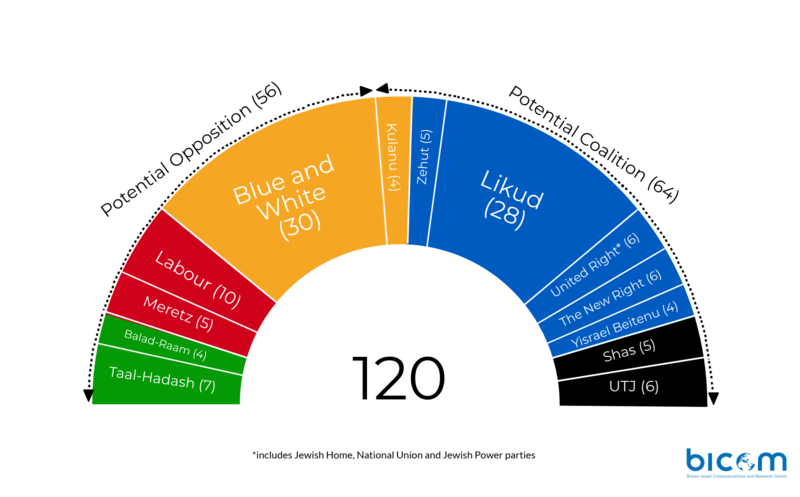 Likud has been predicted to win between 28 and 31 seats since the start of the campaign. This is almost exactly the same number of seats that Netanyahu won in 2009, 2013 and 2015. The base has stayed loyal and Bibi’s strategy to talk constantly about the corruption cases, alleging a leftist witch hunt, and playing down the substance of the cases, has worked. When the Attorney General announced his decision to indict Netanyahu his supporters priced it in to their calculations. 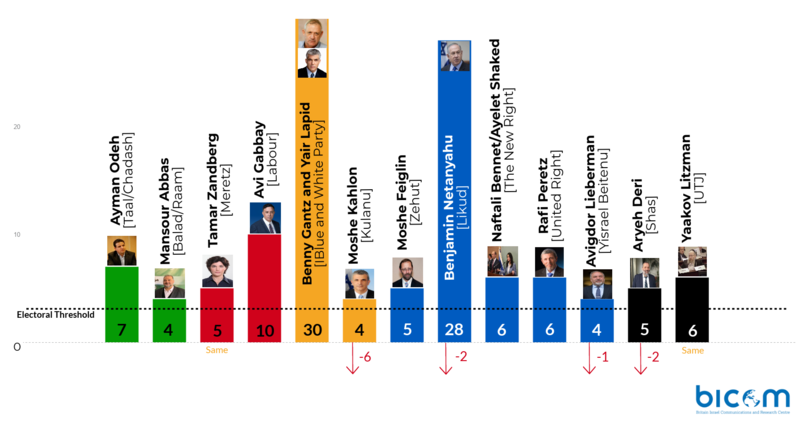 Likud support didn’t budge and the percentage of Israelis preferring Netanyahu to Gantz as their Prime Minister increased after the indictment announcement. Bibi’s record in office matters and its solid. On the bread and butter economic issues most Israelis feel the country is heading in the right direction under his leadership. Unemployment is low, the economy is growing and the advanced knowledge-based sector of the economy powered by tech and innovation is booming. There is shocking inequality, basic goods and housing are far too expensive, but this has not hit Netanyahu’s reputation for economic competence. In foreign affairs and diplomacy Netanyahu has spent the last two years highlighting his successes to the Israeli public and showing off an impressive amount of top rank world leaders. Closer ties with India and China, new alliances with Eastern European and Eastern Mediterranean states, diplomatic relations growing with Muslim African countries, warming relations with Gulf States, friendships with populist strongmen in Brazil, Hungary and the Philippines. Above all, Netanyahu’s relationship with Trump has paid rich dividends. A US Embassy in Jerusalem, formal recognition of the city as Israel’s capital and just recently US recognition of Israeli sovereignty on the Golan Heights. These wins were banked with seemingly nothing required in return and without any pressure from the US for Israel to change tack in relations with the Palestinian Authority and with full support for its strategy in Gaza against Hamas. Last May, Trump pulled the US out of the JCPOA Iran nuclear deal and reimposed tough sanctions on Iran, something Netanyahu had been calling for ever since the deal was signed in 2015. In Syria, Netanyahu managed to navigate a brutal and complex civil war avoiding major Israeli involvement but approving extensive IDF operations against Iranian forces in Syria. These missions severely impaired Iranian forces without any serious injury or loss of life to Israeli personnel. Netanyahu’s business-like relations with Russian President Vladimir Putin allowed Israeli operations to continue even after Russia intensified its presence in Syria. On the basic issue of security there are problems – missiles from Gaza and terrorist attacks in the West Bank. But by the standards of Israeli history the last four years have witnessed a small number of serious terrorist attacks and very few fatalities in IDF combat operations. Bibi’s triumph also has much to do with the skill of his opponents. When Benny Gantz entered politics Netanyahu faced his most serious challenger for years. Gantz has done well. From nothing he has moulded a political force that could win 30 seats. But to win he needed to convincingly beat Likud by a clear margin and that isn’t likely to happen. The campaign wasn’t strong enough, its vision was not clear, its split ticket – with Gantz and Lapid sharing the post of Prime Minister in rotation – was confusing and its punches hurt Netanyahu but not enough to build momentum. Above all it never properly decided what product it was selling. Was this a new, more centrist, unifying future for Israel or was it just Bibi’s brand of right wing security policies without the corruption. This has been a messy and toxic campaign. Israeli elections have always been a raucous and bizarre festival where parties jostle on the national stage and scream for attention. But Bibi’s campaign will be remembered for the careless manner in which he has ruptured the foundations of Israeli democracy – the constant vilification of leftists and his accusation that Gantz will form a government with Arab parties. He worked to ensure a merger of Jewish Home with Otzma Yehudit and bring racist Kahane inspired thugs into the Knesset. His defence against corruption allegations involved undermining the state institutions that guarantee the rule of law and throughout the campaign he has slammed the media for its fake news. Just this week he attacked the President claiming he is attempting to install Gantz as Prime Minister. If Bibi does lead the next Government, he faces huge challenges. His coalition negotiations with putative right-wing allies will involve enormous concessions to their West Bank annexationist agenda in order to secure their support as his criminal case heads to trial. His other option is to reach out to Gantz and ask him to join a national unity Government, something Gantz has explicitly ruled out. But when the results are clear on 10 April the real negotiations will begin. In that frenetic environment, almost anything is possible.